Even after 65 years of Independence, remote villages in Raghunathpur block are yet to get pucca roads. Although villagers of Satapura, Majhisahi and Baishanabsahi villages under Jaisola panchayat of this block have been demanding pucca roads for a long time now, no step has been taken by the district administration to construct them. There are more than 1,000 people residing in these villages. canal. The situation has been like that for the last 25 years. 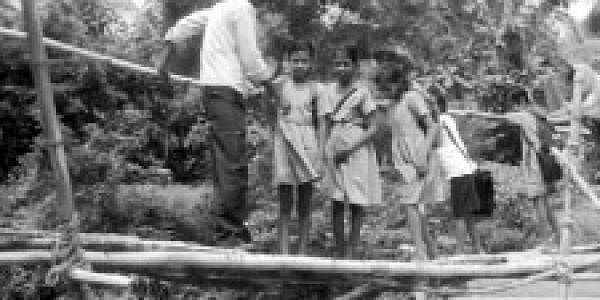 Students often have to cross rickety bridges to reach Satapura Primary School and Jaisola High School. Sarpanch of Jaisola panchayat, Trupti Samantray, said these villages lack proper roads and connecting bridges and this has been taking a toll on the development of the area. “We have repeatedly appealed to authorities concerned to look into the issue,” she added. Raghunathpur BDO Brahamananda Behera said funds would soon be allocated for construction of pucca roads and bridges in the affected villages.